If using a SAT NAV, enter the postcode BS10 7TB! This will bring you onto our private lane. Follow the lane up and continue over the motorway bridge and Max Events will be on your left. At the motorway interchange follow signs round to the M5 – South West. Travel to Junction 17 and come off motorway. Follow signs for A4018 Westbury-on-trym. Straight over 1st and second roundabouts, past BMW showroom on your left. 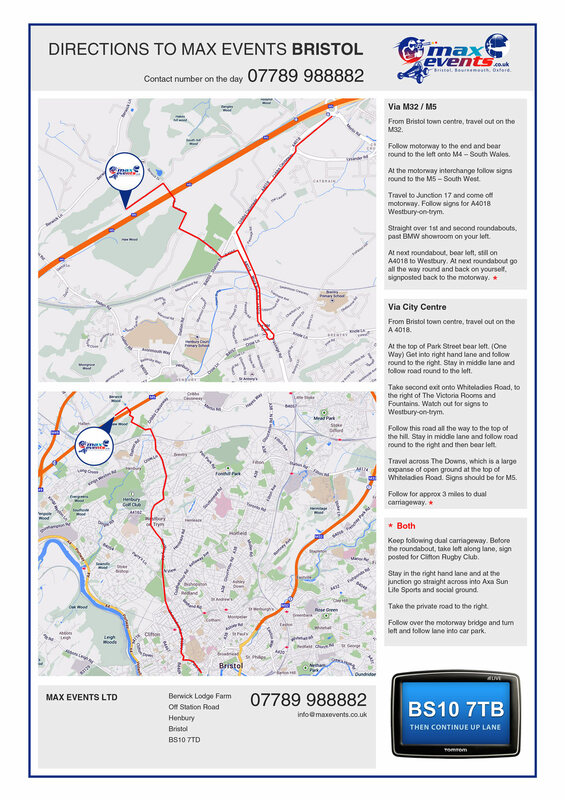 From Bristol town centre, travel out on the A 4018. At the top of Park Street bear left. (One Way) Get into right hand lane and follow round to the right. Stay in middle lane and follow road round to the left. Take second exit onto Whiteladies Road, to the right of The Victoria Rooms and Fountains. Watch out for signs to Westbury-on-trym. Follow this road all the way to the top of the hill. Stay in middle lane and follow road round to the right and then bear left. Travel across The Downs, which is a large expanse of open ground at the top of Whiteladies Road. Signs should be for M5. Keep following dual carriageway. Before the roundabout, take left along lane, sign posted for Clifton Rugby Club. Stay in the right hand lane and at the junction go straight across into Axa Sun Life Sports and social ground. Take the private road to the right. Follow over the motorway bridge and turn left and follow lane into car park.